THANKS TO VINGHOE VELOS CYCLETTA IS A GREAT SUCCESS. Thanks to a strong turnout from the Vinghoe Velos last week the ladies only event was a fantastic event. In fact over 90% of the participants were on bycylces, and were joined by none other than Ms Victoria Pendleton. Unfortunately for VP the Vinghoe Velos were on home ground, and she struggled to keep up for much of the route, eventually stopping in Ivinghoe Aston for refreshment and a thigh massage from Andrew. Whilst there she showed her keen observation skills by confirming that Andrew was indeed not a girl. Once revitalised she rejoined and completed the 25 mile course in a not too bad 27hours and 13minutes. Another world record, and a round of applause from the sealions. Well done to all. We have taken a break from watching the Tour of Britain to bring you news from our head quarters here at Velo Towers. Following on from our highly successful venture into Social Media using Twitter, we are now going to have a stab at Facebook. A page has been set up and if you are a Facebook user, please find us (Search for ivinghoe velos) and say hello (and ‘like’ us). For those not on Facebook, fear not – we have no plans for it to become our main place to distribute news – the website and emails will continue to be the best place to find out what’s going on. There are only 4 more days left open for registrations for the 74 mile Wiggle Rut that takes place on the 25th September. I am very proud to say that the Vinghoe Velos is by far the largest single team with 8 members already signed up. If you would like to join us, please head on over to the Kilotogo.com website and register. As mentioned before, on the 25th the normal ride will take place from the Rose and Crown for those who sensibly don’t feel they need to put themselves through the pain of a crazy distance. And finally, there is the normal leisurely off-road ride in Ashridge taking place tomorrow evening (Thursday). We meet at the Ivinghoe Library at 6:40pm and head up to the Beacon car park for 7pm. Is it a monster? No it’s a Vinghoe Velo, blue shirt glinting in the early morning hue, hair in his eyes, cuddling his handlebars and yelling no more hills, PLEASE Dave. But boy is it a monster weekend. First up Mary Sainty and Friends are heading for the Bucks Historic churches ride, leaving from Ivinghoe Church at 10.00am today. Let’s hope they can bring back plenty of free lead for us. Next up is the Ladies Cycletta which takes place tomorrow morning from whipsnade zoo. Jose comments “It’s not the penguins that bother me, but those bloody bison are enormous. Hit one of those and your bike is gonna be pipework”. Good luck to all the ladies taking part tomorrow, especially the friends and members of the vinghoe velos, as well as the helpers manning the rifles. And of course for the rest of us there is usual Sunday ride. This week we have dropped the short route as there has been no take up on this in recent weeks, with everybody preferring to take the longer ride. However, the longer route is now divided into two groups, the quick set (this is a relative point) and those that prefer a leisurely pace. So if in recent weeks you’ve felt that we’ve all been chasing quick times and high average speeds, when all you wanted was a pleasant ride out on a Sunday morning, and have perhaps been a little reluctant to come along, we’ve now made sure there’s a like minded bunch to go with. We remain a club for people that just want to ride their bikes, irrespective of what sort of bike it is, or how old it is. In fact the more out there your bike is the more welcome you are. Tandems, choppers, and Penny Farthings all welcome. Exotic state of the art bikes are also welcome but please ensure you have no athletic ability whatsoever if you want to turn up on one of these. And so here is this weeks ride. A few of us who are preparing for the Wiggle Rut on the 25th September are going to head off from Pitstone roundabout at 9am tomorrow (4th September) to get in a warm up workout before joining the long ride at the R&C from 10am. If you feel like adding a few more miles you are most welcome to join us. If anyone is still thinking of registering for the Wiggle Rut, please do enter your team name as “Vinghoe Velos”. We will be sorting out sharing the transport up there soon so please let John Hegarty know you are going. 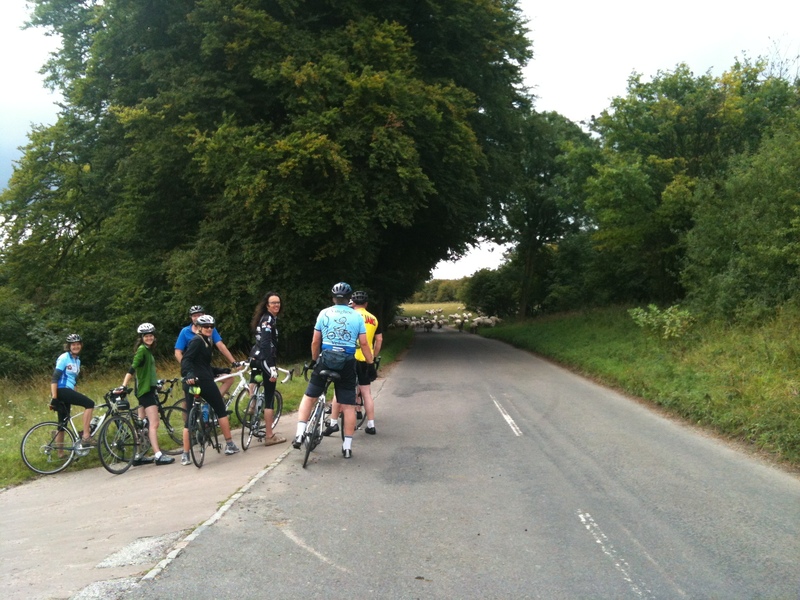 And completely unrelated, here is a photo from the ride last week where we had an unusual type of road blockage. Welcome to this weeks ridees and general up date on nothing to do with cycling. As some of you may know I have recently been in Italy helping their gypsy economy get back on track, and looking after their unemployed at the Giro Italia. This is not as some people think the italian version of Etch a Sketch or Spirograph. Now when many of us think of Italy, we often think of exotic cars or cheeky little runabouts, but what of your average italian I hear you ask. Well much to my surprise, and despite reports of their economy being in poor shape, I can confirm that Mr 2.4 in Tuscany seems to getting by in his castle and vinyard rather nicely. And his wine tastes jolly fine too. So there we are, a complete review of the italian economy in one paragraph, and in less words, our rides for tomorrow.